When two months of holidays were almost going to be over, a sudden plan of visiting Malaysia and Singapore came up. As soon as we returned from KL and Singapore, there rose an oppurtunity for a quick visit to Bangkok! The beauty, culture and spirit of South East Asia – each country different and unique by its own, yet similar! Culture, Religion, Behaviour, Lifestyle, Traditions – beyond the marked differences there is still a thin line indicating the centuries of give and take. While KL and Singapore experiences would follow later, the beauty of Bangkok that lies very fresh in my mind makes me write about it first. So, the very recent ones first. Bangkok seemed to be a mixture of traditional and modern things in the same shell. I think this fusion is something that makes Bangkok the most visited place in the world. 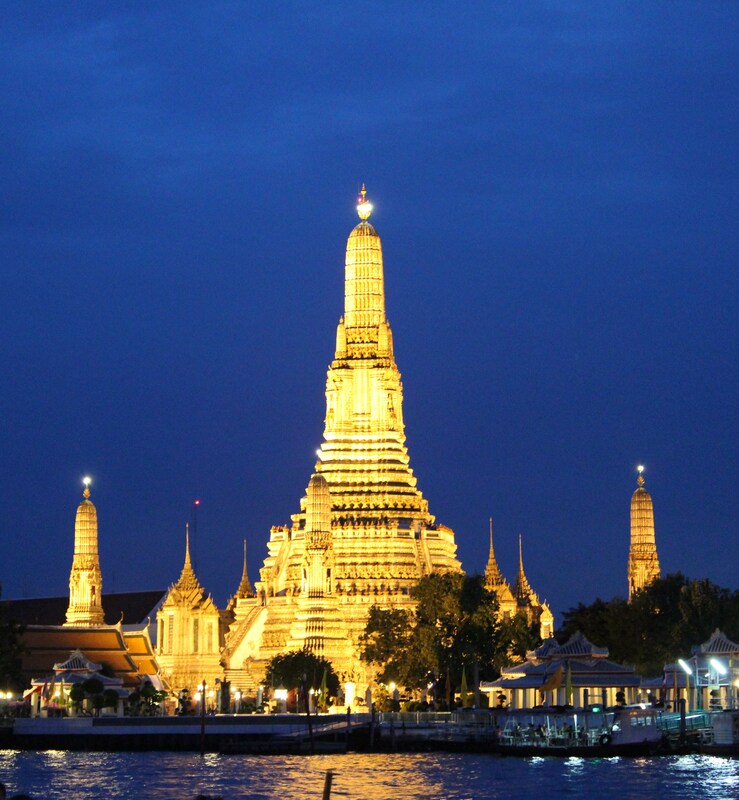 Bangkok, Thailand will be the number one destination for tourists in 2013, according to MasterCard’s new Global Destination Cities Index. For the religious and heritage lovers – huge Buddhist temples; for the fashion and shopping lovers – the small, medium to big malls; for the cullinary lovers – street food, food courts in malls, restaurants offering different cuisines of the world to chose from and speciality THAI restaurants for those with heavier pockets; for relaxing the global community – the innumerable massage centres to classy Spas; for true tourists who believe in nights by the water – river cruises and dinner cruises, Bangkok has so much to offer! Leaving aside the traffic jams and busy roads, the Metropolitan Rapid Transit or MRT is a very comfortable transport system, called the Underground Train. It is called the BTS or sky train. Under the Metro Rail System, the Airport Rail Link is a very comfortable service which is available from the Airport itself. This is a great boon for tourists, for the first timers not knowing the routes and the used passengers alike. 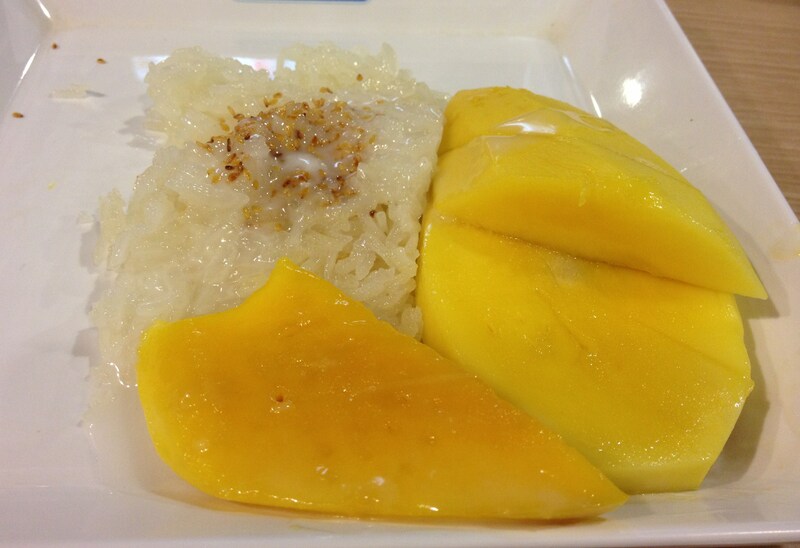 I had this dessert in mind – and I wanted to taste it after seeing it as one of the best foods to be tasted in Thailand – It is called Khao Neeo Mamuang in Thai language or the Mango Sticky Rice. It is cooked rice sweetened with a sauce of coconut milk, sugar and salt; served with sliced mango and garnished with the coconut milk sweet sauce and roasted sesame seeds! We got it served cold. 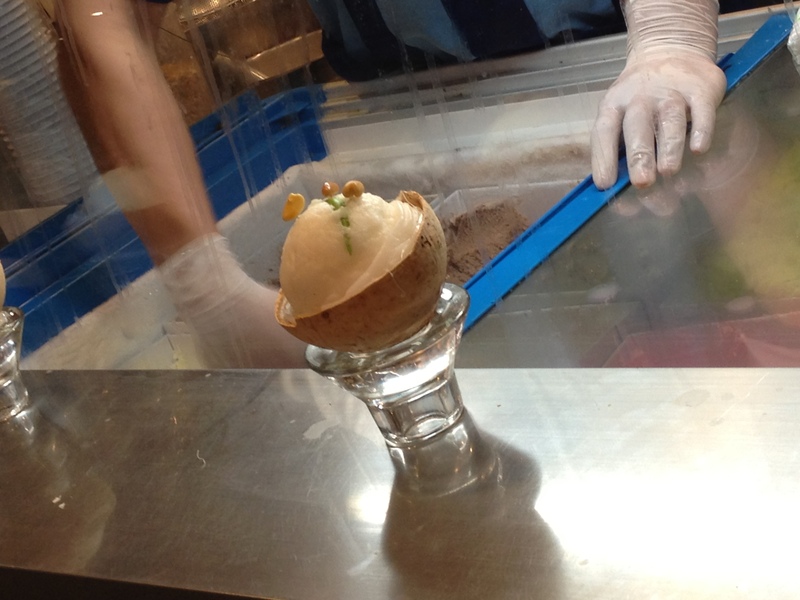 This is certainly a refreshing dessert – that gives a soothening effect to the tummy after all those spicy Thai Curries! 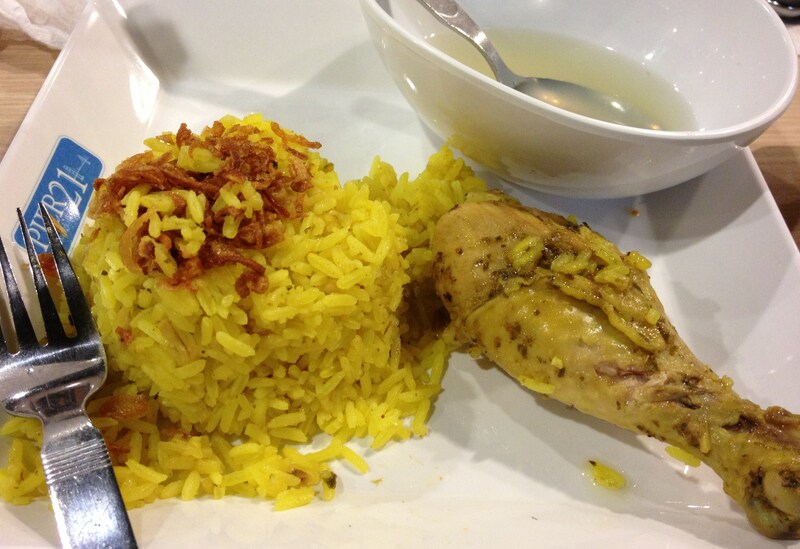 Another version – served at street corners comes in the next post! Now, let’s talk about the enchanting places we visited! 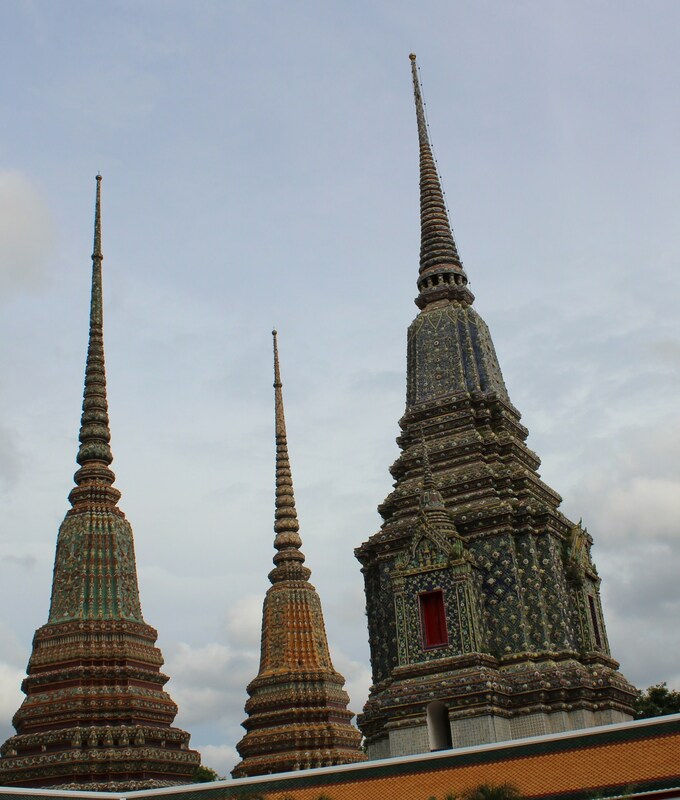 The first day, we planned to see Wat Pho and Wat Arun. The word Wat in general denotes a place of worship, here denoting Monastery Temples. 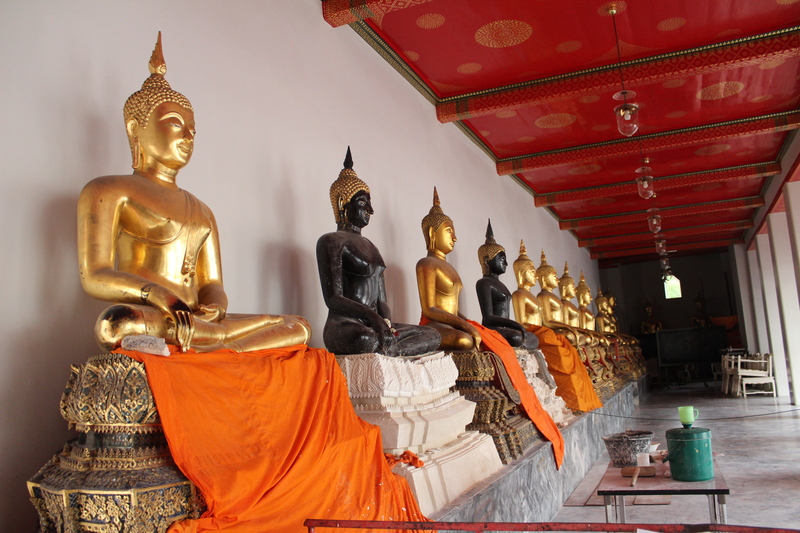 Wat Pho is the oldest and largest temple in Bangkok. The first temple was built in the 16th Century and consecutive renevations and additions have been done by successive kings. 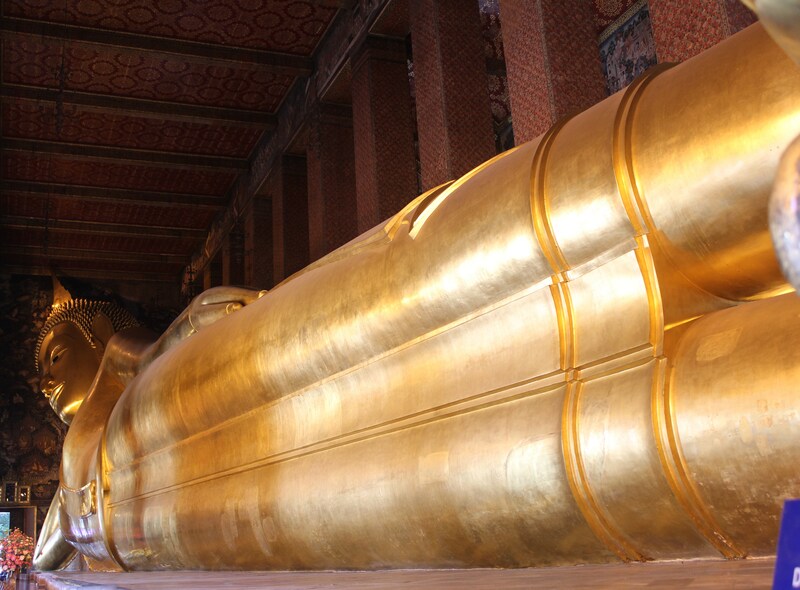 Inside the temple complex lieds the biggest Buddha in reclining position in Thailand. This statue is 46 metres long, with the dimensions at the face of 15 metres high and at each foot of 3 metres high and 5 metres long. 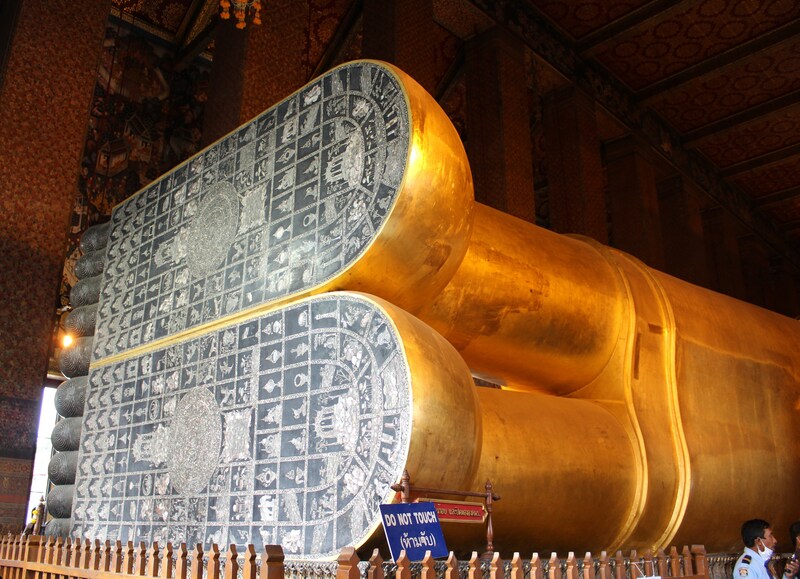 The soles of the statue’s feet are inlaid with mother-of-pearl showing the 108 auspicious signs of the Buddha. 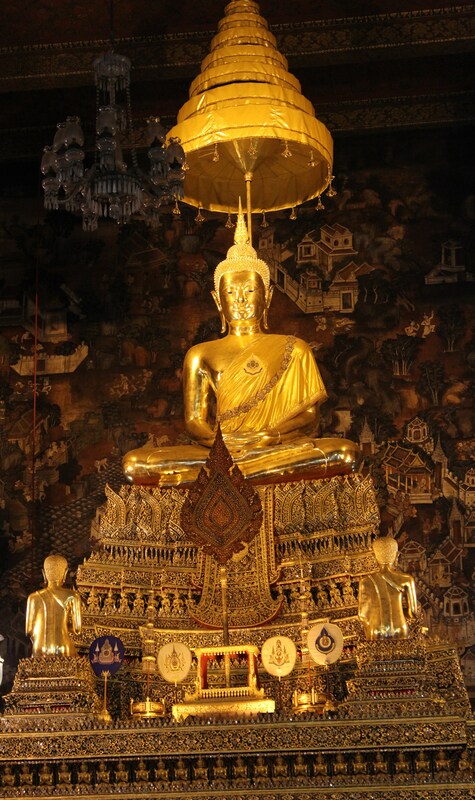 This is the largest and most beautiful piece of fine arts of the Buddha image in a reclining position found in Thailand. Inside Wat Pho runs the Thai Traditional Medical School where Courses on traditional Thai Massage are conducted. The second important building inside the temple is the Phra Uposatha – the Main Chapel where monastic rituals are performed. A tour inside the temple complex lets one admire the numerous Buddha statues bright. 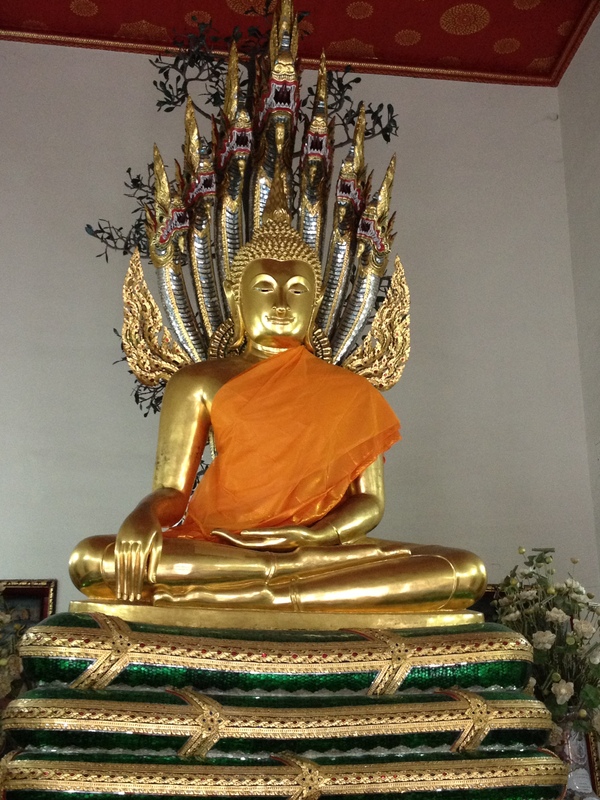 In the West Vihara there is an image of “ Pang Nak Prok ”, the Buddha under the Naga’s hood. One of the most interesting features of the temple is the stone and rock statues. 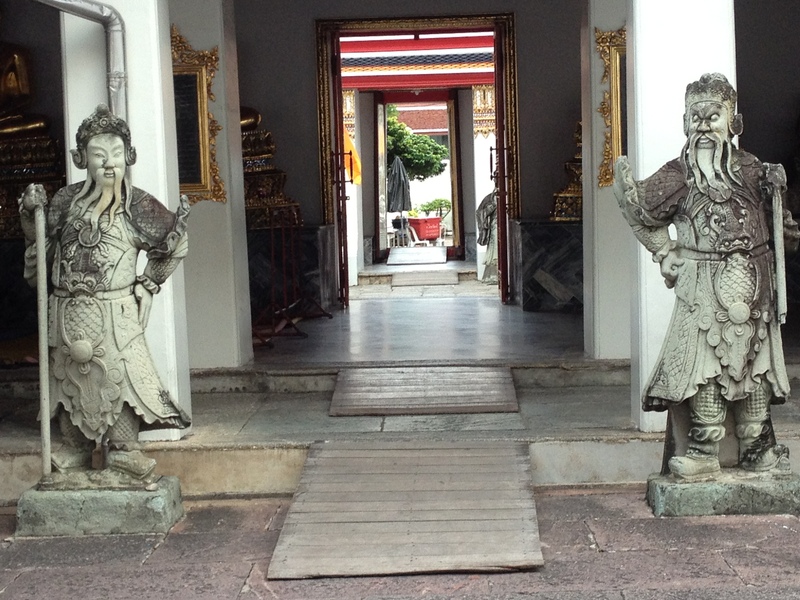 These Chinese statues stand as guards inside the corridors of Wat Pho. Very interesting to note the facial features and the amazingly well sculpted emotions on the faces. 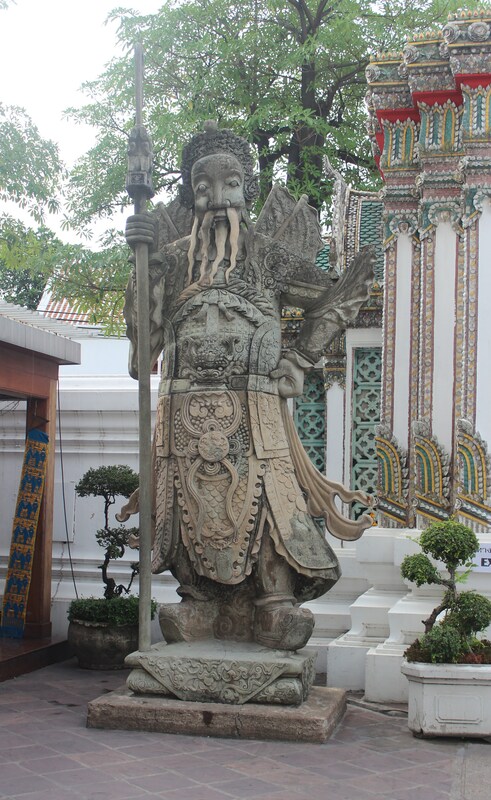 These statues arrived into Thailand from the ships which brought in goods from China. These were used as Ballasts to provide stability to the vessels during sea voyage. Bangkok has so much to offer, historical and modern… the old ones captivating the hearts and minds with their skillful architecture and beautiful techniques employed centuries ago. Shall continue with more! Next Post Bangkok – An Architectural Splendour! You have lot of patience. keep it up I am really happy to see your site. Thanks Kalai for your encouraging words. Thank you for another wonderful post. It makes me want to travel! Thanks Caroline! Bangkok is truly a tourist friendly city, not to be missed. Thanks Soniji! 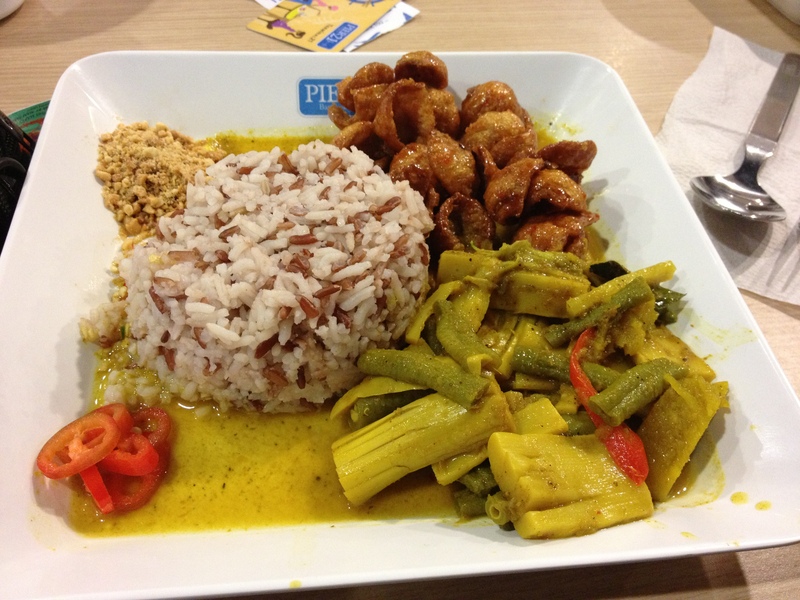 Yes amazing food and neatly maintained temples are some of the highlights of Thailand.